If you are unsure about GE food, consider this: the potential harm to human health caused by glyphosate (AKA Roundup®) has been clearly established. 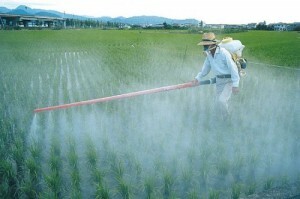 In the continuing debates for and against the genetic engineering of food an important issue is often overlooked–the steep increase in the spraying of herbicides during the cultivation of herbicide-resistant GE crops, in particular the massive rise in the use of a chemical called glyphosate, one of the main components of Monsanto’s weed killer, Roundup®. Glyphosate is the world’s most widely-used herbicide. Current research shows that glyphosate is showing up almost everywhere, from mothers’ milk to bubbling brooks. It is probably in the soil in the park where your child plays. It is in the air and it is in rainfall. It’s probably in your urine. 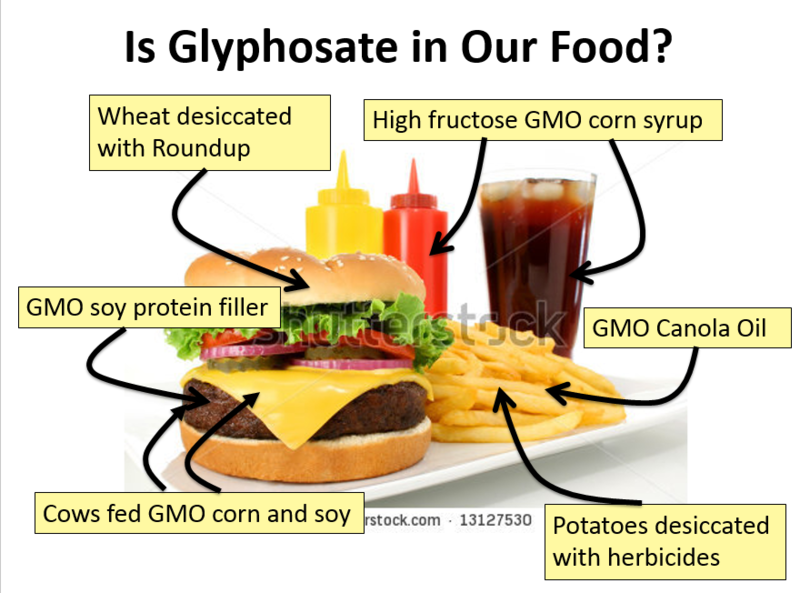 Glyphosate is widespread in the food supply, not just in GE corn and soy, but also in non-GE crops like wheat, non-GE vegetables, and even in meat from animals that have consumed GE crops. 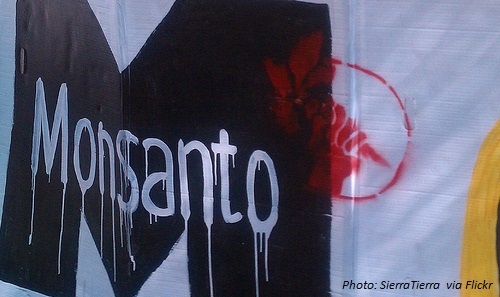 Monsanto claims that the body excretes it quickly. Others claim that it bioaccumulates. Later we will discuss why you should care, but first of all, how did this happen? Biotech companies claimed that their new technology would be better for the environment and human health because the GE crops would require the application of less herbicide. In contrast to what biotech firms promised, in the US, herbicide-resistant crop technology led to an increase of 527 million pounds in herbicide use between 1996 and 2011. These figures are based on research published in 2012 by Dr. Charles Benbrook while at Washington State University. According to Benbrook, the spread of glyphosate resistant weeds, an outcome foreseen by researchers who were concerned about the potential risks of planting GE crops, has contributed to substantial increases in both the quantity and types of herbicides applied to GE crops. Benbrook predicts that with the development of new GE crops, designed to be tolerant to an older herbicide called 2, 4-D, a component of Agent Orange, the use of herbicides will increase by 50%. In the last decade, the use of glyphosate as weed control has been extended to nonagricultural practices. Road crews, for instance, routinely spray it to combat weeds along highways and secondary roads. In parts of the US-Japanese knotweed has become a persistent and hard to eradicate invasive along roadsides, replacing the former growth of native wildflowers. Glyphosate is commonly and repeatedly used to subdue this plant and many others. The spraying of glyphosate has also been used with increasing frequency during the production cycle of many other non-GE food crops as a time-saving, pre and post-harvest practice, making it easier for farmers to harvest and then “clean up” their fields after the herbicide has destroyed the remaining foliage on the plant. Federal promotion of GE corn crops for ethanol has been another factor in the rise of the use of glyphosate. This increased usage means an increased accumulation of glyphosate, both in the environment and in the human body. The direct impact on human health stemming from the consumption of GE food has been arguably difficult to track, in part because no long-term clinical trials on the health effects of the consumption of GE foods on human beings have been conducted. Also adding to the confusion for consumers, three US agencies take responsibility for the oversight of GE crops: the Environmental Protection Agency (EPA), the Food and Drug Administration (FDA), and the U.S. Department of Agriculture (USDA). Each of these agencies regulates GE crops from a different perspective. 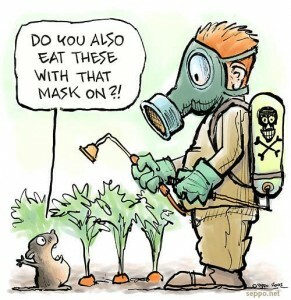 The FDA is responsible for regulating the safety of GE crops that are eaten by humans or animals. The history of regulation of GE foods by the FDA began in 1992 when the FDA claimed that it had no information to show that GE foods were in any way substantially different than non-GE food; GE foods were officially declared “substantially equivalent.” This core assumption has been found problematic by many and contradicts core assumptions in other parts of the world. For instance, the EU took the opposite position by framing its assessments from the perspective of the “precautionary principle.” The FDA official responsible for the US policy was Michael Taylor, who worked previously as an attorney for Monsanto and later as its vice president. This decision countermanded warnings from FDA scientists that the consumption of GE foods could result in hard to determine, long terms side effects such as nutritional problems, allergies, toxicity and even new diseases. In spite of the lack of concern on the part of most federal regulators, in recent years a number of doctors, scientists, and institutions around the world have advised against the consumption of GE food, including the American Academy of Environmental Medicine. While human subject research into the health effects of GE food may be lacking, there are numerous studies that demonstrate impaired health for animals fed GE food. For instance, in studies with rats, the French scientist, Gilles-Éric Séralini, and his colleagues, linked the consumption of GE corn to disruption of the endocrine system and the development of various tumors. Although initially disputed and retracted from publication the research was later revalidated and republished. 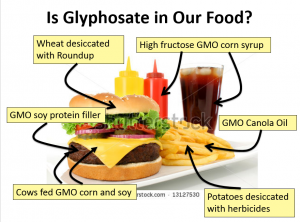 In contrast to the difficulty of proving that the consumption of GE foods decisively harms human health, the effects of glyphosate on human health is emerging more clearly. This is possible in part because, according to Pamela Coleman Ph.D., scientists can examine the specific biochemical action of an herbicide or pesticide in relation to diseases that have been linked to the malfunction of that biochemical pathway. Substantiating evidence can be seen in many other sources, such as a study in the International Journal of Environmental Research and Public Health which has linked the use of Roundup (AKA glyphosate) with a series of epidemics of fatal kidney disease among poor farmers in several regions of the world where GE crops are widely planted. What does this research suggest in layman’s terms? The evidence is growing that glyphosate reduces the body’s capacity to detoxify unwanted chemical residues that impair bodily functions. Monsanto claims that its herbicide cannot harm human health because it works on something called the “shikimate pathway” which exists in plants but not in humans. This is misleading because the shikimate pathway does act on the multiple kinds of bacteria that inhabit our body numbering ten to one in relation to human cells. Our bodies rely on beneficial bacteria to synthesize several amino acids which combine with others obtained through diet to create complete proteins, the crucial building blocks of the body. Some of these amino acids cannot be obtained through diet. For specifics about the way in which glyphosate suppresses beneficial gut bacteria while fostering the growth of more harmful strands of bacteria, see Glyphosate’s Suppression of Cytochrome P450 Enzymes and Amino Acid Biosynthesis by the Gut Microbiome: Pathways to Modern Diseases. So much current research focuses on the importance of the gut biome in human health, in relation to everything from depression to allergies, that it seems wise to heed the evidence that glyphosate is harmful to human health. In Part Two we will discuss the continuing debate and our conclusion.